Caribbean > Mustique villas > Trip Reports > Why did the Turtle Cross the Road? There is just something about Mustique that will have you smiling from head to toe from the time you touch down at the bamboo airport till your last Mule drive to Basil's Bar. While we were there, I kept remembering back to camp days, the natural, casual setting and traditions that made the days there so special, and everyone resisted change and modernization that might dilute those good memories. It may be strange to describe "one of the most exclusive islands in the world" as casual and a bit reminiscent of camp, but that's how I felt because of its laid-back nature. Luckily here on Mustique, your assigned cabin is a fantasy villa with gorgeous views and a smiling staff ready to ensure your total relaxation. The Mustique of today has an interesting history which started with the purchase of the island by Lord Glenconner. Soon after, he gifted 10 acres to Princess Margaret and before long Mustique was attracting the wealthy and famous looking for a private retreat in the Caribbean. The island is now run by The Mustique Company who just celebrated their 40th anniversary in August 2008. 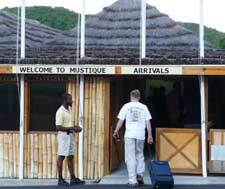 The most common arrival to Mustique is via plane from Barbados. After 45 minutes we arrived at the cutest airport I have ever seen and were greeted by our butler, Noel who helped us through customs and led us to our Mule (an open-air motorized vehicle) for the quick 5 minute drive to Villa MV CAP. Anyone visiting here will be driving around in a Mule or other golf cart-esque vehicle on roads where the most common form of traffic is a turtle crossing the road. The island is only 3 miles long and 1.5 across, so it doesn't take long to get familiar with the roads. The Mule tops out at about 30 MPH, so you'll have plenty of opportunity to take in the view as you drive. Our villa, like many of the villas on the island, has a private resort feel to it due to the vast amount of land and open large living areas. The first thing we noticed upon our entrance was the spectacular view across the water to St Vincents and Bequia. Second thing, the lovely Judy who greeted us with icy cold rum punches. The villa itself is sprawling and has so many areas to congregate, dine, or just lay back for a sunny nap. I kept forgetting that it was only a 3-bedroom villa because of the endless space. The first stop after claiming our rooms was the large pool on the bottom level. It was delightful and had perfect views of the islands in the distance. Just a short walk from that pool down towards the beach and you stumble upon the second pool! This one is equally as large with an infinity edge and the constant music of waves crashing. The beach is just a few steps from the pool deck and we couldn't believe that the sea water was even warmer than the pool, probably the warmest sea I have ever felt. Villa MV CAP is set on 9 acres of land, much of it a hilly palm grove perfect for evening walks to spy on the resident turtles. The large amount of land is common at the Mustique villas lending them to be very private retreats. Privacy is a core asset of this island which the Mustique Company protects and the guests value.